In an age of easily-accessible information, misinformation abounds. In a world with more books, peer-reviewed articles, and professionals dedicated to understandings the intricacies of the past, present, and future of the universe, many people (perhaps even most people) are shockingly uninformed. While this paradox of unknowing plagues almost every field of human interaction and learning, it is especially acute within large portions of the Christian Church. To the detriment of their faith and witness, Christians of all types know strikingly little about the Bible and history of their Church. Not surprisingly, then, Christianity has developed its own set of urban legends, those stories which are commonly circulated as common knowledge despite their inaccuracy. 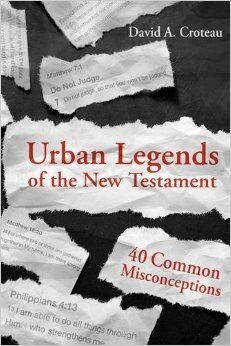 To dispel some of these myths, David A. Croteau has penned Urban Legends of the New Testament: 40 Common Misconceptions (Nashville: B&H Academic, 2015), a clear and straightforward work which begins the process of clarifying and explaining away some of the most common misrepresentations of the New Testament. Urban Legends of the New Testament is a wide ranging work, addressing a variety of historical, theological, cultural, and interpretive issues from across the New Testament. Divided into two sections—Urban Legends in the Gospels and Urban Legends in the Acts of the Apostles, the Epistles, and Revelation—this work canonically walks through some of the most common misrepresentations and myths surrounding the New Testament. To name but a few of the topics considered, Croteau investigates where Jesus’ birth occurred (hint, not in a cave), if “hell” referred to a garbage dump outside of Jerusalem, Paul’s occupation, if women should where jewelry, and much (much) more. For Croteau, several principles inform his consideration of these urban legends of the New Testament. Of primary importance is the desire to understand and apply the scriptures accurately. 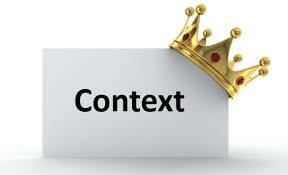 Vital to this process is the recognition that “context is king” and must inform our reading and application of scripture. Of similar importance are the recognitions that biblical description does not necessarily entail prescription for daily life and that all correct knowledge must be handled with humility. These principles not only make for a fascinating and informative (re)consideration of New Testament texts, but also offer readers much needed tools for their regular interaction with the scriptures. That is, not only does Croteau dispel some common urban legends in this book, but he also demonstrates a contextually-informed practice of biblical interpretation in an easy-to-understand manner. In his analysis of New Testament legends, Croteau helpfully distinguishes between mistaken legends (which contain wrong information) and misleading legends (which are not incorrect, but incomplete). In each chapter he outlines a legendary teaching on its own terms before offering an “unraveling” of the myth that encompasses several sections on Biblical, historical, and cultural information pertaining to the topic at hand. After busting each myth, each chapter proceeds to offer an application of the non-legendary interpretation—an important and relevant step in Croteau’s process—before concluding with an annotated bibliography for further reading. While not every reader of Urban Legends of the New Testament will agree with all of Croteau’s interpretations, his process and emphasis on context make for a compelling and insightful read. 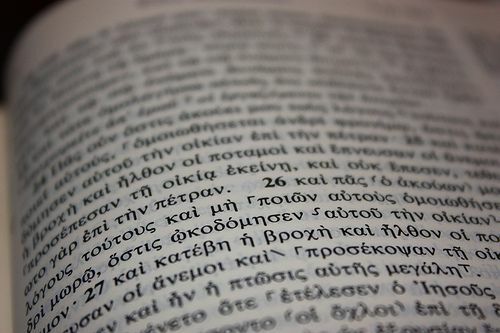 After considering forty of the most common misconceptions regarding the New Testament, Croteau ends with a summarizing epilogue, where he outlines some findings. Most importantly, he notes the three primary causes of these urban legends: reading without understanding of literary context, surface level interaction with the Greek text, and ignorance or misunderstanding of historical and cultural background of a passage. Importantly, Croteau continues on to diagnose the solution to these problems with context, Greek, and background by calling for closer consideration of literary context, deeper interaction with Koine Greek, and additional study of historical and cultural context of the New Testament. Most critically, Croteau argues that most of these urban legends can be clarified simply by paying closer attention to context, be it literary, historical, or cultural. Urban Legends of the New Testament: 40 Common Misconceptions comes highly recommended for pastors, New Testament scholars, and Christians interested in better understanding their Bibles. The tools in this volume are especially beneficial for those seeking to accurately interpret and apply the New Testament text, and readers transitioning from a “lay” to “leadership” roles in Church and Academy alike will benefit from the more contextually informed reading of the New Testament text advocated here. Biblical misinformation and ignorance can only be rooted out through education and critical thinking, and Urban Legends of the New Testament is a great place to start.